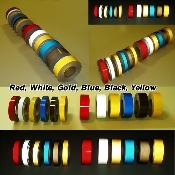 REFLECTIVE TAPE STORE - Division of Reflective Inc.
1" 2" 3" 4" inch x 30 foot reflective tape roll. Available in White, Black, Red, Blue, Yellow, Green, Orange and Gold. 3 inch x 150 foot reflective tape roll. Available in White, Black, Red, Blue, Yellow, Green, Orange and Gold. Copyright © 2007-2019 REFLECTIVE TAPE STORE - Division of Reflective Inc. All rights reserved.